Architects impact the lives of everyone in the communities they serve. The architectural profession employs more than 275,000 Americans and it is part of the design/construction industry, which represents 8 percent to 10 percent of the U.S. economy. Architects need a strong voice on a wide range of issues from community planning, housing, sustainability, building codes, project delivery, historic preservation, and many other issues. Through the AIA, Architects have a unified voice on issues important to us all. The AIA Delaware Government Affairs Committee welcomes all interested AIA Delaware members who wish to participate in AIA Delaware's advocacy efforts. The Committee deals with both legislative and regulatory issues impacting the profession of architecture, architectural practice and other matters related to design and construction in Delaware. The committee meets periodically via conference call, contact director@aiadelaware.org if you would like to attend. The AIA represents the interests of architects before federal government and policy-making bodies. This outreach, coupled with sustained member participation and active involvement in the political process, enables the AIA to advocate on behalf of legislative, regulatory, and related issues important to AIA members. Learn more at aia.org/advocacy. Created by AIA National, this resource is designed to help you tell your architectural story; let the AIA Message Book be your guide for crafting clear, positive, and memorable messages to a variety of audiences and settings. While there is great respect for architects, there’s little understanding of what we do, or how our work affects others. It’s our job to help others understand what we do, and more importantly, why it’s important to them. We know well that when we collaborate closely with clients, we can design and build better homes, communities and public spaces that benefit us all. 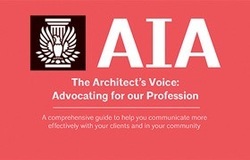 The Architect’s Voice: Advocating for Our Profession assists you in explaining the work of architects. It uses message points, statistics, and anecdotes that you can customize or share as examples with clients, civic leadership and community. Supported by a tremendous amount of research and developed with AIA members, this guide helps bridge the gap between architects and the public.